Is your skin a bit dry and you’re looking to get some moisturizing action into your pores? It’s time to look for a good – no – great after-sun lotion. You don’t want to put on any old cream. You need a lotion that is as awesome as you; something that will keep your tan fresh, moisturized, and most importantly, not peeling. Or maybe you’ve even gotten a bit crispy? All the more reason to slather on some after-sun goodness. After-sun lotions often differ from regular moisturizers as they have actively soothing ingredients such as aloe vera, which help keep irritation at bay. But besides that, what makes a good lotion? Well, it comes down to what you’re looking for. Do you want something totally natural? Something for sensitive skin? Something gentle for daily use, or something stronger for occasional use? Lotions on the market serve a wide range of different needs so there is definitely something out there that matches what you are searching for. But what is the best after sun lotion? Not to fear – SimplySunSafe is here to help! 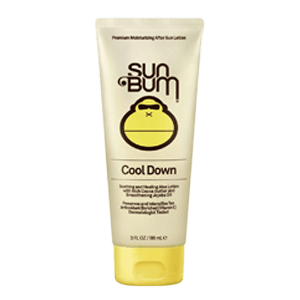 After a lot of research into different lotions on the market, I recommend Sun Bum Cool Down Hydrating After Sun Lotion as the best after sun moisturizer. Keep reading for a detailed buyer’s guide, comparison table, and in-depth reviews of the top 5 lotions to find the best after sun treatment for your needs. Long lists of obscure ingredients raise questions – what is it exactly that I’m putting on my skin? However, it is also quite normal for products (especially lotions!) to come with at least some non-natural ingredients. You may find preservatives to help maintain its shelf-life, fragrances to make it smell good, thickeners to make it less liquid, and so on. Sometimes long lists can also mean that the product has more ingredients that are actively working to soothe your skin, reduce irritation, provide healthy cell renovation, and of course, moisturize! So, it largely comes down to you – what do you want to avoid and what are you OK with? Glycerin: Glycerin is the second most used ingredient in cosmetic products after water. It is a naturally occurring humectant that cools the skin. Even synthetically derived glycerin is safe for the body, as it reacts the same way as it does to natural glycerin. Linalool, Citral, Citronellol, Limonene: These are all elements in a variety of essential oils such as lavender, orange, and rose. They are often used for their pleasant aromas to make products smell good. While natural and beneficial in a variety of ways, they can also be allergens and cause irritation to sensitive skin so buyers beware if you have sensitivity to these ingredients. Petrolatum: This is a chemical moisturizing agent. When it’s pure, it’s not harmful, however, when it is not refined properly, it can be mixed with other chemicals in which it does pose risks such as cancer. Parabens – methylparaben, propylparaben, or any ingredient ending in -paraben: These are chemical substances that prevent the growth of unwanted bacteria, especially in waterier cosmetic products. They have been linked to health issues such as breast cancer and while small quantities are used in many daily products, they are better avoided when possible. Of course, it’s impossible to go into detail of every ingredient in after-sun products, so to learn more, you can find information about different cosmetic ingredients on the Safe Cosmetics Organization website. Another factor that will likely make or break a lotion for you is its odour. A lotion may be after-sun moisturizing magic, but if you can’t stand the smell of it on your skin, you probably won’t use it anyway! Many products come lightly scented with subtle fragrances, because, well, who doesn’t love to smell great? However, if you are sensitive to smells, you’ll want to be extra careful before purchasing a scented product. Moisture is the main thing your skin needs after long periods of time in the sun, so naturally you’ll want to look for an after-sun product that moisturizes well. But what’s the difference between an after-sun lotion and a regular moisturizing lotion? Well, the main difference is that an after-sun lotion will often include ingredients that help soothe the skin in addition to moisturize. Aloe vera is the most commonly used ingredient for this, but coconut oil, chamomile, Greek yoghurt, cucumber, and jojoba oil are all examples of other soothing ingredients often included in after sun formulas. With these added soothing agents, not only is your skin getting the moisture it desperately needs after being in the sun, but it will feel relieved thanks to the cooling and calming effects of these ingredients. When shopping for an after-sun lotion, make sure to take these factors into account to ensure you are getting the best product for your individual needs. However, to save you time researching and looking around, SimplySunSafe has done the work for you! Below you will find a brief comparison table of the top 5 after sun lotions followed by a deeper product analysis. After thorough research into the different after-sun options on the market currently, which included analyzing the existing best after sun lotion reviews, examining manufacturing details, and partaking in skin care forums, SimplySunSafe has chosen Sun Bum Cool Down Hydrating After Sun Lotion as the top option. Each recommended product moisturizes very well and includes soothing agents to help rejuvenate damaged skin, and each one also has very high customer approval ratings. Sun Bum Cool Down Hydrating After Sun Lotion is SimplySunSafe’s choice for the best after sun lotion. It is specifically designed to nourish skin after sun exposure, and to reduce peeling to keep your tan fresher for longer. The light, non-greasy formula can be used on adults and children alike and is dermatologist tested to be hypoallergenic. It also absorbs quickly and is 100% vegan. We especially love that Sun Bum’s Cool Down line comes in three different application types: lotion, spray, and gel, to provide you with options depending on what you like best. And no matter which application type, they all maintain the same fresh cooling ingredients to moisturize your skin and preserve your tan. 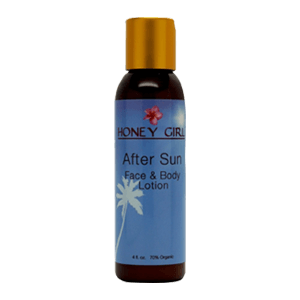 Honey Girl Organics’ After Sun Lotion is the best natural after sun lotion out there. Its ingredients are 100% natural and 70% organic to replenish your skin naturally. With a list of ingredients as natural as this one, you can ensure that you are treating your skin kindly. It is free of parabens, chemicals, glycerin, fragrances, hormones, silicones, petroleum products, artificial preservatives, fillers, and unnatural additives. Produced in Hawaii, the lotion is on the more expensive side, but it is probably the best after sun lotion for sensitive skin you can get. It relieves pain from sunburn and also prevents peeling. Not just for the sun, this lotion is great for treating dry skin all year round. Get Honey Girl Organics After Sun Lotion Now! This 97% organic body lotion is rich in antioxidants that help rejuvenate skin from sun damage. It is certified natural personal care by NATRUE, ensuring that the product has undergone a strict, two-part certification process including an ingredients audit and an on-site inspection. You can find out more about NATRUE certifications by checking out their website. Buyers love Weleda Sea Buckthorn lotion for its multiple uses as well – while it is perfect as an after-sun product, it is gentle enough to also be used as a daily moisturizer to nourish and protect dry skin. Additionally, it has a long shelf-life and since it is light, you do not need much to spread it all over your body. The main complaint of buyers is the scent. While the majority like its fresh, citrus scent, others find it a bit too strong. 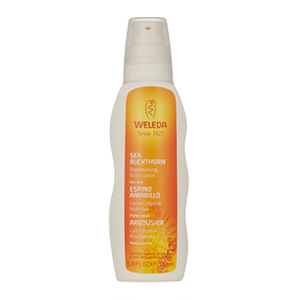 Get Weleda Sea Buckthorn Replenishing Lotion Now! 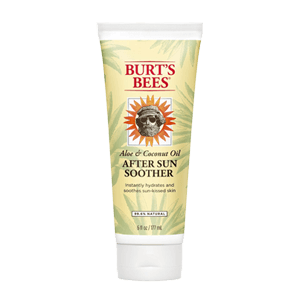 Burt’s Bees after-sun lotion is a delicious mix of aloe vera extract and coconut oil that replenishes sun-kissed skin. While the aloe soothes, the coconut hydrates. It is a non-greasy and quickly-absorbing formula that helps maintain skin healthy, soft, and moisturized. While it has a subtle scent and is a gentle formula, this Burt’s Bees product does contain some added fragrances that can be irritating for people with very sensitive skin or delicate burns. If you are unsure, you can test the product on a less sensitive part of skin before spreading it in everywhere. Added fragrances can cause irritation in sensitive skin. Get Burt’s Bees Aloe & Coconut Oil Soother Now! This rich and creamy after-sun formula has buyers raving about its delicious tropical scent and its soothing effects on skin. 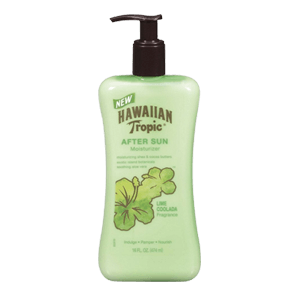 Using island botanicals, aloe vera, shea and cocoa butters and fortified with vitamins A and E, Hawaiian Tropic After Sun Moisturizer replenishes skin that’s been damaged by the sun, wind, and water. 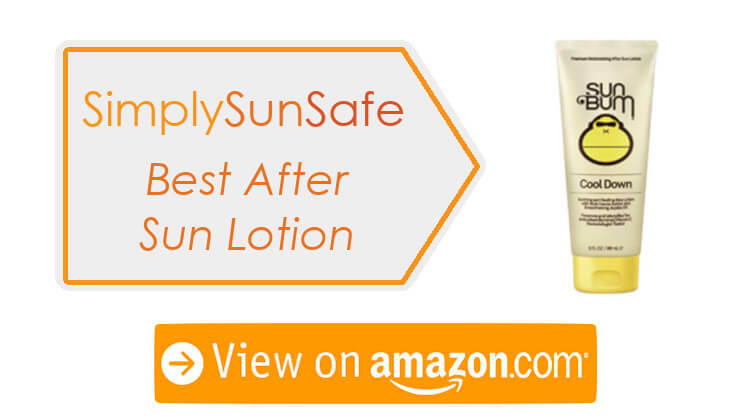 SimplySunSafe does not recommend it as the best option out there since it contains a long list of ingredients including parabens and alcohols, and especially suggests avoiding it if your skin is burned or irritated. However, in other cases, it is a very light, non-greasy lotion that can be used on sensitive skin and which helps you keep your tan looking fresh. Get Hawaiian Tropic After Sun Moisturizer Now! I wrote this guide for people searching for the best after sun skin care. Hopefully, by reading this, you have gained more knowledge about different lotions on the market to soothe your skin after exposure to the sun. While all listed products are great for various needs, SimplySunSafe recommends Sun Bum Cool Down Hydrating After Sun Lotion as the overall best option due to its natural and environmentally-friendly ingredients, its approval by dermatologists, and its options of application types – lotion, spray, or gel. If you are considering a gel instead of a lotion, I also encourage you to read SimplySunSafe’s review of different aloe vera gels out there. There is nothing like the aloe vera plant to soothe skin after sun exposure, so check out our article about aloe vera to find out what is the best aloe vera gel for sunburn. I always love to hear about other new products and to hear about your experiences with the current ones so if you have any further recommendations, please leave a comment below. I can’t wait to hear from you!